The Golden Knights are going to pick up a few more points before the season ends. I promise. But you’re going to be hard-pressed to identify a better two points than the ones the Knights secured Tuesday night in Tampa. Coming back from a two-goal deficit on the road against the best team in the NHL and dealing with some sketchy officiating while losing one of their forwards, even getting one point was a tremendous accomplishment. Give the players and coaches all the credit. They easily could’ve packed it in, especially given the fact they came into Amalie Arena in the throes of a franchise-worst four-game losing streak and had failed to register a single point in the standings since January 19. Yet the Knights hung in, kept battling, never allowing things to get out of hand. And that tenacity was rewarded with a 3-2 shootout win over the Tampa Bay Lightning. As always, it started in goal where Marc-Andre Fleury matched Andrei Vasilevskiy shot for shot, right through the shootout. Brayden McNabb, who has raised his level of play this year, was tremendous in his usual, understated way. 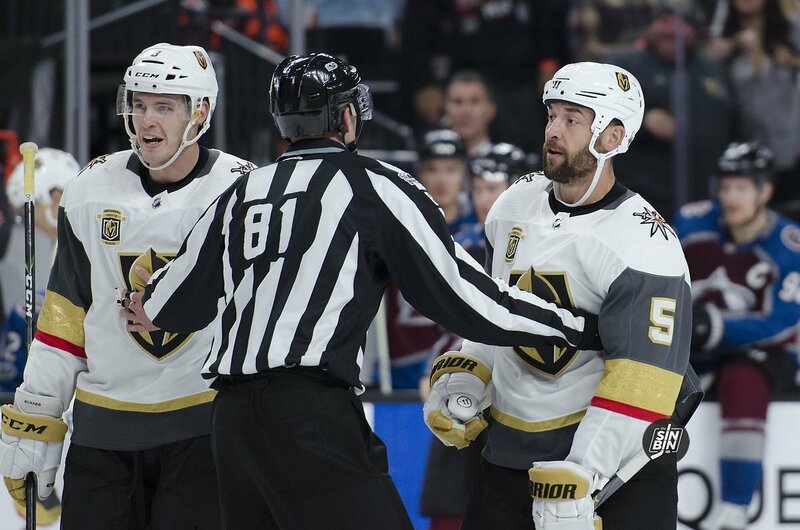 I’ve come to really appreciate all the things McNabb does, particularly on the penalty kill, where he and Deryk Engelland have been solid on the first unit going on two years now. Up front, Cody Eakin never stops working. His game is so much better this year and his goal to get the Knights within 2-1 was obviously huge. No less important was the great stretch pass off Jon Merrill’s stick to spring Eakin into the clear. Merrill is another player who has made great strides in his second year in Vegas. And while it was good to see Valentin Zykov find the net, it was just as rewarding to see William Karlsson and Jonathan Marchessault get back on the scoresheet in helping set up Zykov’s game-tying tally. Finally, having Alex Tuch apply the coup de grace with his shootout goal has to give his confidence a boost. The residual benefits from a win like Tuesday’s are numerous. Let’s start with the cold, hard facts. With the two points accrued, the Knights kept pace with second-place San Jose, which garnered two huge points of its own with a 3-2 overtime win at Winnipeg. The Knights, who now have 64 points, are five points out of second. Vancouver, which was quietly playing itself into position to pounce into third in the Pacific, lost at Washington. So the Vegas lead over the Canucks is back to 10 points and the Knights picked up a little breathing room. The four-game road trip, which began with a pair of losses in Carolina and Florida, is suddenly salvageable. Beat the Red Wings Thursday in Detroit and finish the trip at .500. Is that a great accomplishment? Normally, no. But consider what has been going on with this team since Jan. 19 when they throttled the Penguins at T-Mobile Arena. A 2-2 roadie will be a nice accomplishment. It will also provide some positive momentum as eight of the next nine games are at home, starting Saturday against Columbus. If the Knights are going to make their move at passing the Sharks and take a run at the division-leading Calgary Flames, this is it. And it will take Marchessault and Karlsson to lead the way. Which was why it was important for them to be involved offensively Tuesday. Getting Zykov his first VGK goal was certainly nice. But this is about No. 81 and No. 71. As I wrote Sunday, Marchessault and Karlsson (and Nate Schmidt) need to lead this team. They might not grip the stick as tightly now and psychologically, contributing to a win may be exactly what both needed. Zykov, incidentally, looked a lot more comfortable playing with Marchessault and Karlsson, which is to be expected. He has had two strong games in a row and you can figure he’ll be on that line come Thursday at Detroit. 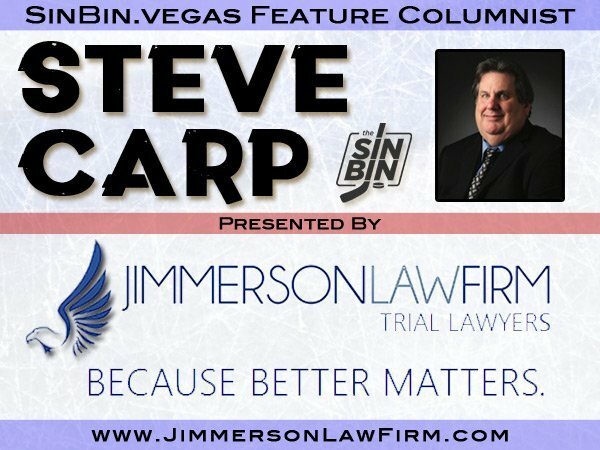 I’m guessing Ryan Carpenter is likely headed to IR after sustaining what appeared to be a concussion on a hit that should’ve been called boarding and brought with it a major penalty and possible game misconduct. But that’s the sketchy officiating I referred to earlier. Assuming Carpenter is out, that should open the door for Tomas Nosek’s return to the fourth line and leave Reilly Smith and Brandon Pirri to skate with Eakin on the third line. Pirri is struggling right now and perhaps a couple of vets like Eakin and Smith can get him back on track. The Knights are going to need the third line to contribute offensively if they’re going to make their serious push in the Pacific standings. But Tuesday’s result should get everyone to relax. Maybe even a game of Duck Duck Goose is in order at the rink during Thursday’s morning skate at Little Caesars Arena. They’ve earned the right to have a little fun after playing Hide-and-Seek prior to coming out of the darkness Tuesday. That was a cheap hit Carpenter suffered. Boarding as per the very definition but because Ryan Carpenter isn’t a bigger name his own health well being and longevity of his career suffer for it. Gutless officiating and the Nhl needs to start holding people accountable unless they want a return to the stick swinging to head days.